(NationalSecurity.news) Two Russian Tu-142 “Bear” naval reconnaissance aircraft made low-level approaches to within a mile of the U.S. Navy carrier USS Ronald Reagan, prompting it to scramble four F/A-18 Super Hornets in the latest incident ratcheting up tensions in the South China Sea region. As reported by Stars and Stripes, the Russian planes made their approach at 500 feet as the Reagan conducted exercises with elements of the South Korean navy Oct. 27, according to 7th Fleet spokeswoman Lt. Lauren Cole. The incident took place in waters east of the Korean Peninsula. U.S. Navy officials attempted to make contact with the Russian aircraft but received no radio response. One U.S. ship followed the Russian planes as they withdrew, Navy officials told the paper. The Tu-142 approach was just the latest in a series of incidents involving Russia. On several occasions over the past year, Russian military aircraft have tested international boundaries either by violating a sovereign nation’s airspace or engaging in what the Pentagon has described as “provocative” actions towards U.S. and NATO warships. — In April, a Russian Su-24 fighter/bomber made a dozen “close-range, low-altitude” passes near the USS Donald Cook, a guided missile destroyer, as it operated in international waters in the western Black Sea near Romania. — In September, NATO officials announced that Russian fighter jets violated Turkish airspace on a number of occasions. — Also last month, Japan alleged that Russia violated its airspace over the northern Japanese island of Hokkaido. 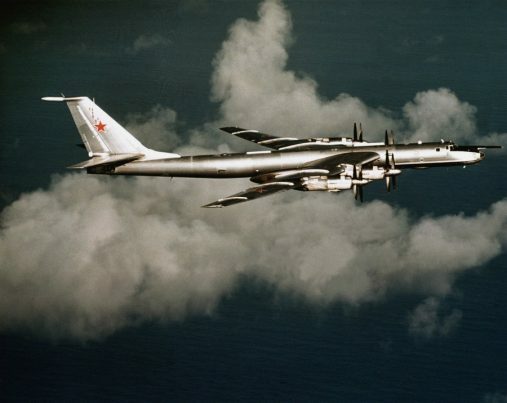 — A Russian Tu-95 bomber carrying a nuclear weapon was intercepted by British fighters in February as it traversed the English Channel. U.S. officials have said there is no objection on their part to Russia or any other country flying or sailing wherever international law permits. The Russian encounter took place at roughly the same time as a separate U.S. warship, the USS Lassen – another guided missile destroyer – sailed to within 12 nautical miles of a Chinese manmade island near the Spratly Island chain. As reported by The Wall Street Journal, the White House pledged future patrols in the region as it insisted that they were in line with international law, while Beijing’s policymakers began contemplating their next move. Have you visited our online store? Click here for the NationalSecurity.news Commissary!